Update: I have since come up with a different poundcake recipe, should you be interested in trying that one as well. and stir until thoroughly mixed. NB: The chocolate I used was Green & Black's Organic Dark Chocolate, which according to the label was "infused with spices and a twist of orange." My pound cake did not come out super-chocolately, but it did have a really delightful spiciness to it! Pour the chocolate mixture into the dry ingredients and stir until incorporated. 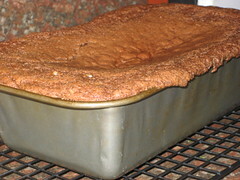 Pour batter into an oiled 9"x5" bread pan and bake at 325 degrees Fahrenheit for 65 minutes. Why can't I have pretty things? Verdict: As you can see, my cake collapsed a bit, but that seems to be my lot in life. After cutting away the overflowed edges, I was able to successfully turn it out and slice off some pieces. It was super crumbly at first, but after it had cooled off completely it held together pretty well. Maybe not quite as dense as I'd want a pound cake to be, but it tasted great. Not super-chocolately as previously mentioned, but it sure was fantastic with some strawberries and vanilla soy ice cream. 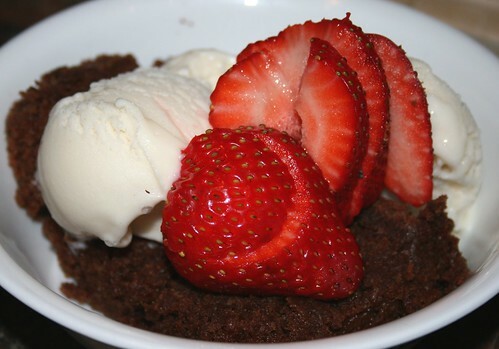 Update: A newer version of this recipe is available here. and saute over medium heat for a few minutes, until the liquids have been mostly evaporated and the contents have been thoroughly combined. in some warm water, just long enough to soften it. If you haven't worked with spring roll wrappers before, be advised that it might take some getting used to. They can be sticky and tear easily, which can be pretty frustrating. 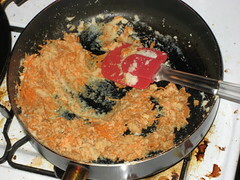 Above: You can see that I didn't clean the pan after cooking the okara mixture in it. It really wasn't necessary! 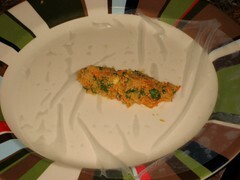 Put a heaping Tablespoonful of the okara mixture into the center of the spring roll wrapper. 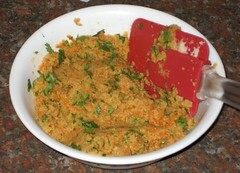 Fold the spring roll wrapper around the okara mixture, as if you were folding a burrito. Fold one side over, then fold the bottom up toward the center of the wrapper. Then fold the top down toward the center of the wrapper, and then take the center part with the okara mixture and roll it toward the other side. Repeat these steps -- soaking a spring roll wrapper, putting down a Tablespoon of filling, and folding the wrapper -- until you run out of the okara mixture. 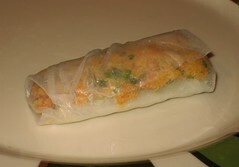 I was able to make seven spring rolls with this recipe. I used canola oil but something like sesame oil might be more appropriate for a dish like this. 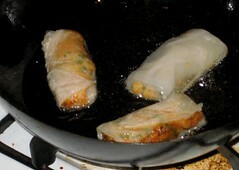 After a few minutes, turn the rolls over and fry on the other side for a few minutes. They might turn a little golden, but spring roll wrappers seem to stay pretty light in color ... Unless you fried it for a really long time, I guess. It wasn't necessary to fry these for very long. 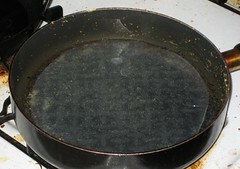 Remove from oil and drain. I drained them on a paper towel, to which a few of the spring rolls stuck, so maybe it'd be a better idea to drain them on a wire rack. Verdict: I really liked the way these tasted! I didn't even use a dipping sauce. The spring-roll wrappers, however, were a little on the sticky/chewy side, so these probably would be even better with wonton wrappers. I can't find ready-made wonton wrappers that are eggless, however, and they are kind of a pain to make by hand. But if you would like to make your own wonton wrappers, or if you can find appropriate wonton wrappers at the store, you might like to use those instead. 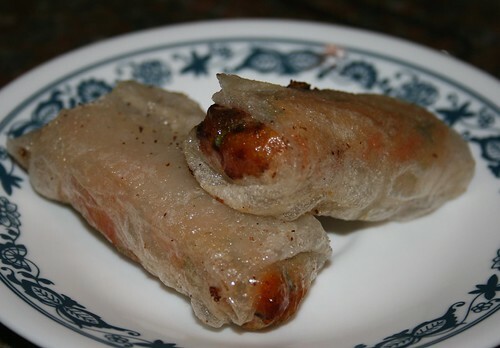 I would probably consider this to be one of my best okara recipes if I used wonton wrappers instead of spring-roll wrappers. This recipe only made seven spring rolls -- since I was just experimenting, I didn't want to make a whole bunch in case the experiment ended in failure. If you want more than seven, feel free to double, triple, etc., the recipe.